After a 45 minute walk around the neighborhood after work tonight, I was more than ready for dinner. The walk was very chilly, but I bundled up and headed out to walk in the snow flurries! It was a brisk walk to get my blood flowing and legs moving. I haven’t talked about my exercising too much on the blog lately, but I have been trying to get some type of physical activity in on most days of the week. That includes walking, running, swimming, ellipticalling and lifting some light weights. Running is definitely getting harder, so swimming and walking are my new two favorite activities! I think that it is important for a pregnant woman to get some type of exercise everyday, even if it is a 20 minute walk. It is good for both you and the baby, and definitely helps with sleeping at night along with many other things. Plus, it’s nice to have that time to devote to each day to clear your head before the baby comes! I wanted to eat my hand off when I got home, so I needed to make a super quick dinner. 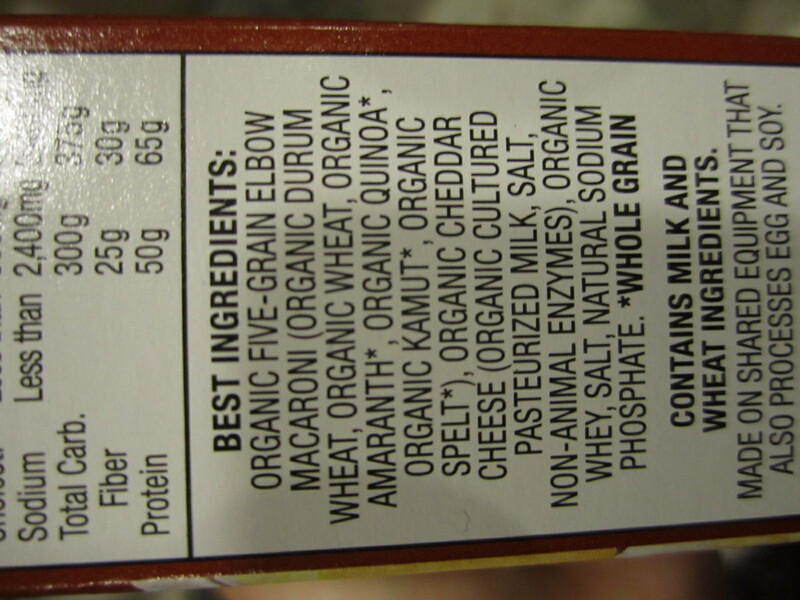 I picked up some Annie’s Mac & Cheese at the store today made of a variety of grains: amaranth, quinoa, kamut, spelt and whole wheat. 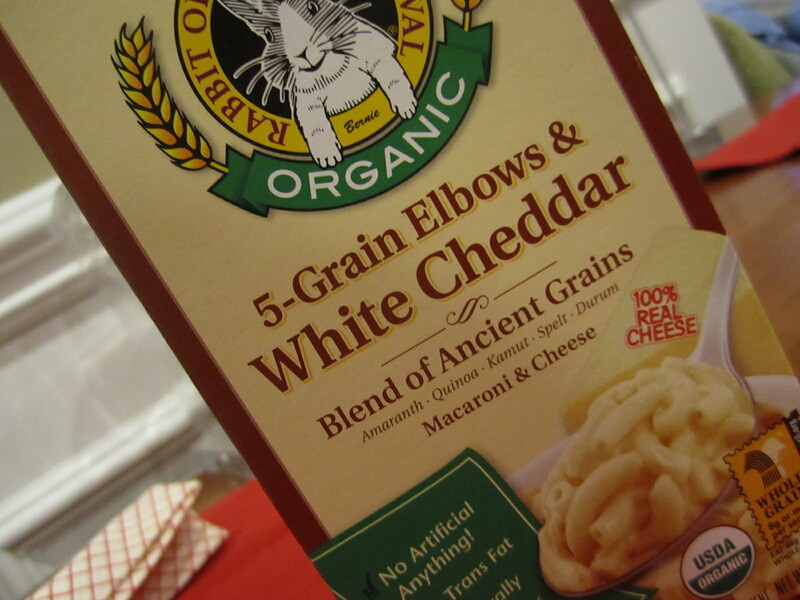 It was cheesy and delicious! Served along with a simple salad to get some vegetables. 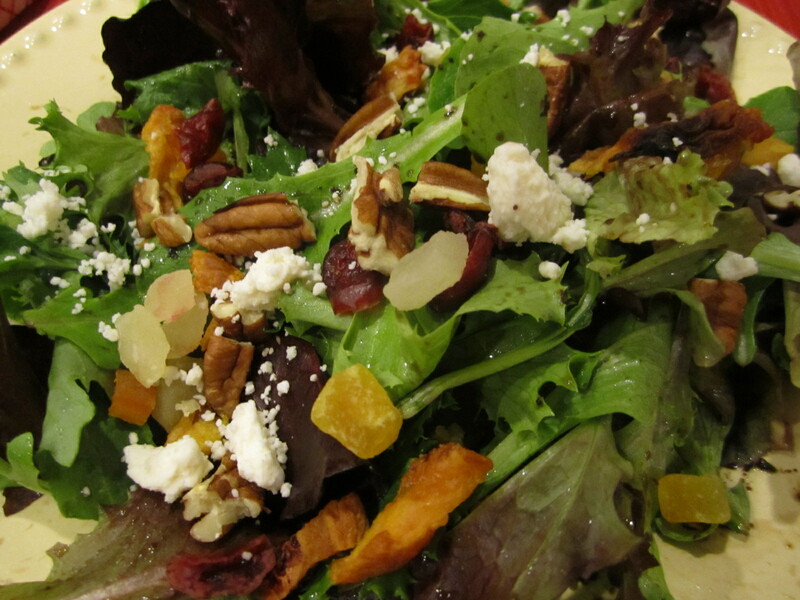 This has been my favorite salad recently – filled with lettuce, dried fruit, nuts, cheese and a honey herb dressing. 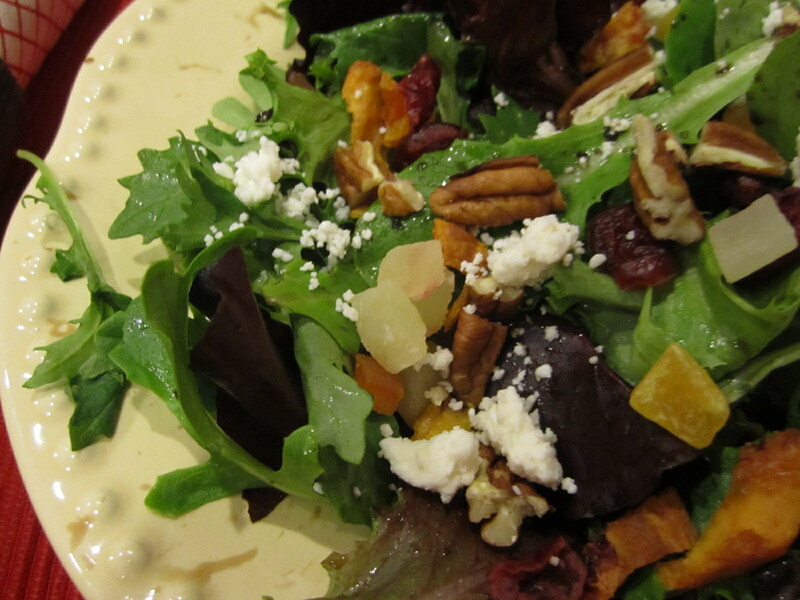 A delicious dinner – quick & healthy! 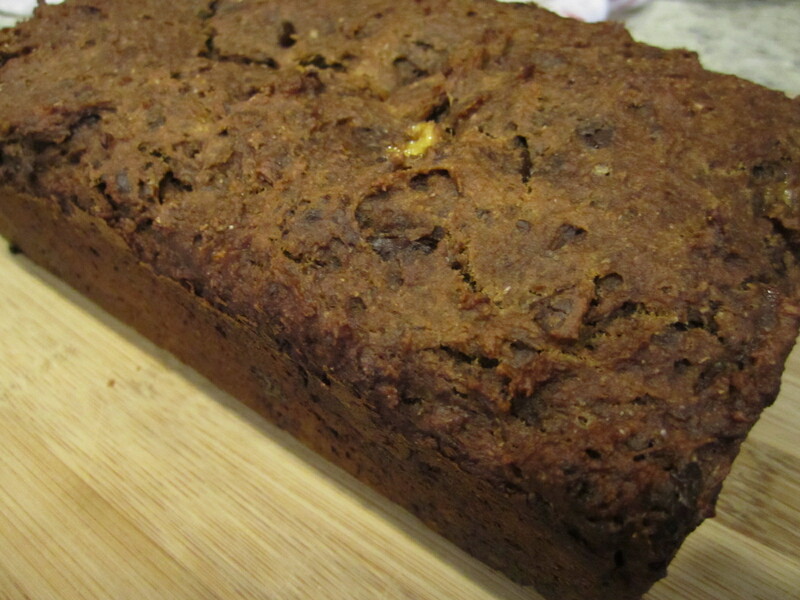 After dinner, I whipped up Emily’s Peanut Butter Chocolate Chip Banana Bread. I followed the recipe exactly, only making one substitution – dark chocolate chips, instead of vegan chips. Everything else was the same…and it came out perfect! 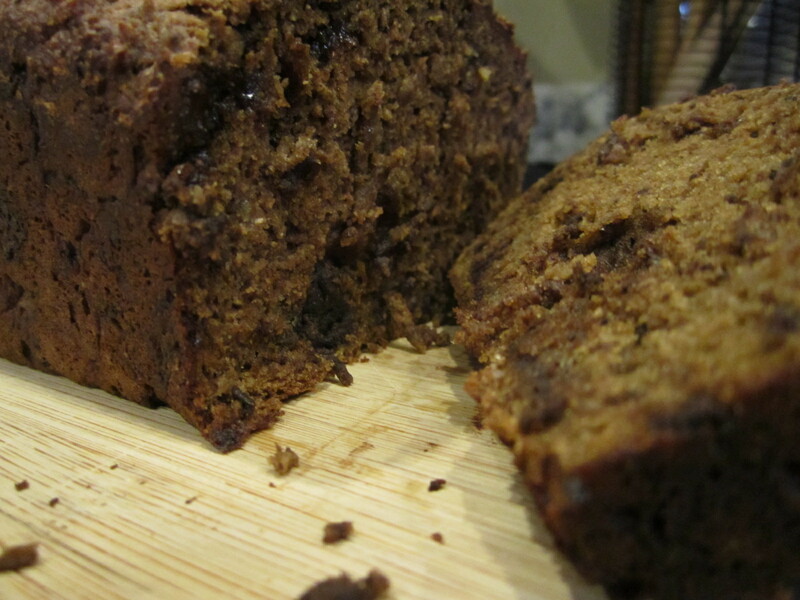 The outside seemed a little dry, but on the inside it was just as moist as Emily says – delicious! I enjoyed a few slices hot out of the oven with a glass of milk. 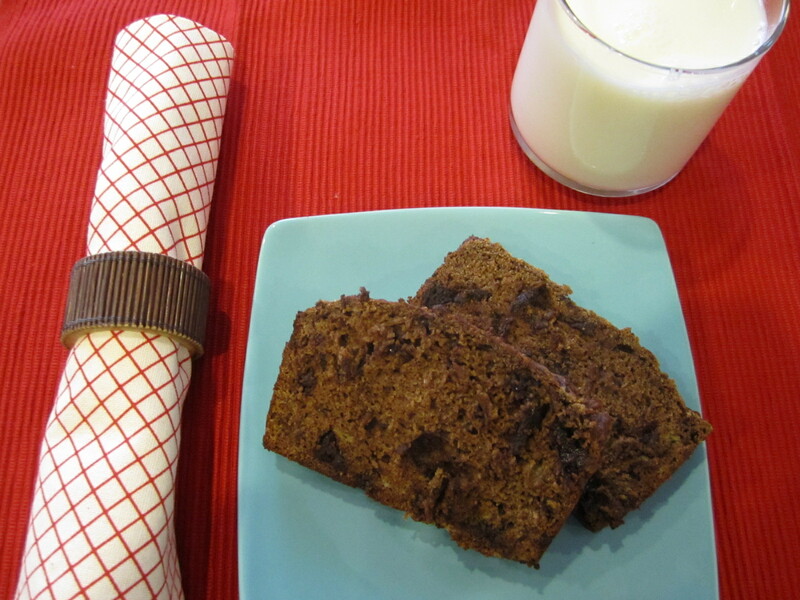 Who doesn’t love chocolate, bananas and peanut butter?! 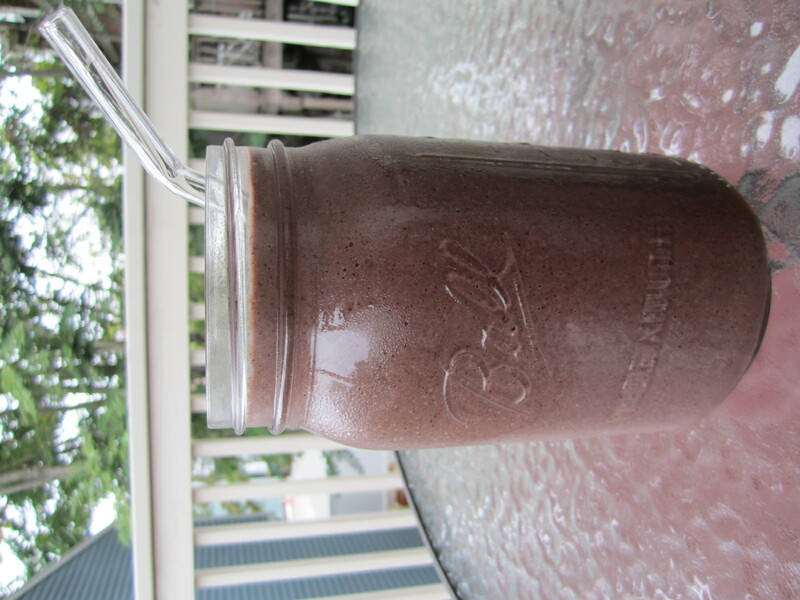 However, since it felt like summer this morning, I whipped up a cold smoothie for breakfast. My favorite Chocolate Cherry Bomb! With cacao nibs on top. 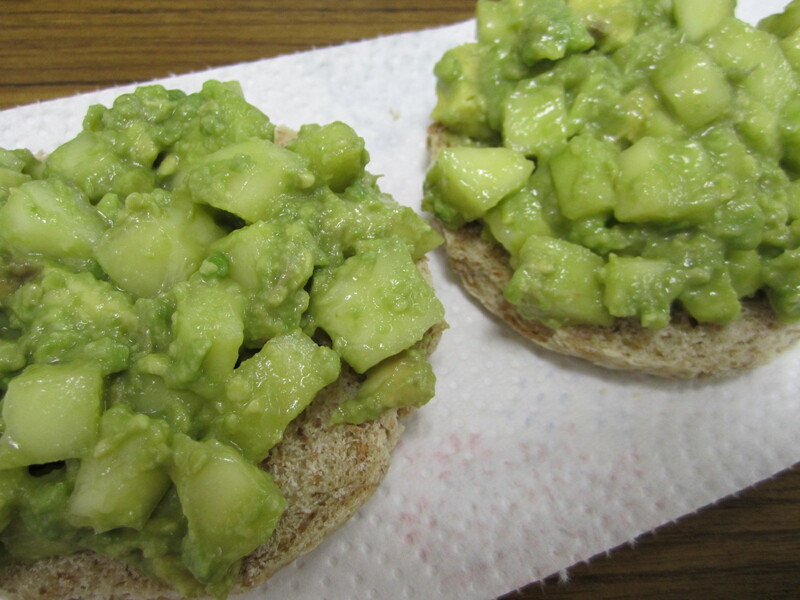 Lunch was AB&J on Flax Quinoa Bread from Whole Foods. Definitely some of the best bread ever! But, I forgot to snap a photo. Snacks yesterday included fruit and trail mix. 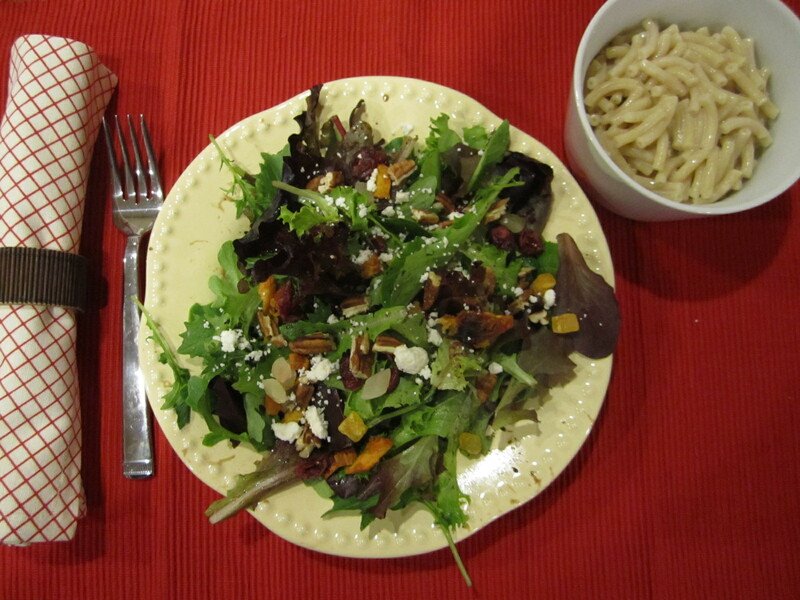 For dinner, we made a special weeknight meal. It barely took anytime at all to cook, but it felt more special due to the ingredients. I started out by getting the quinoa ready, so that it would cook while we were cooking the other things. I used a recipe from Clean Food cookbook for Quinoa with Currants, but I subbed currants for dried cranberries. Everything else was the same, except that I just threw it all in my rice cooker to cook at once! 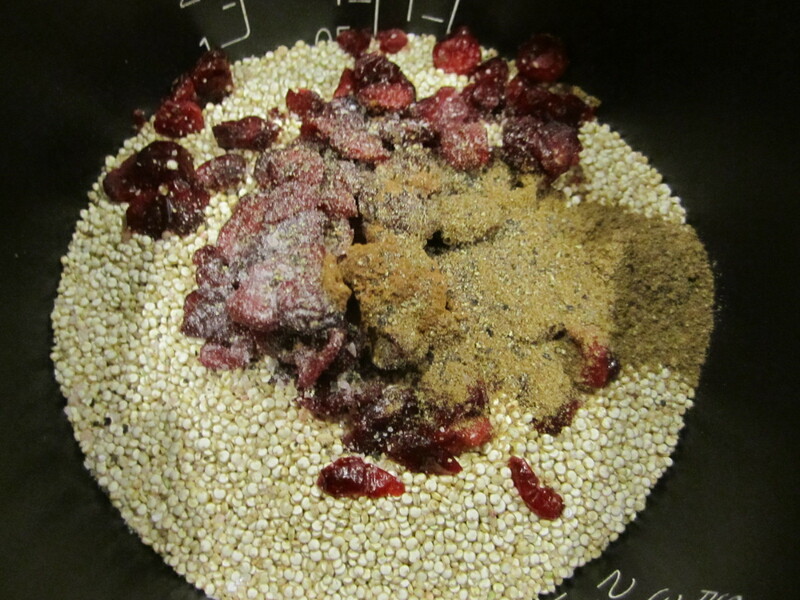 Into the rice cooker went the quinoa, cranberries and spices. I added the water and set the cooker to quick cook. 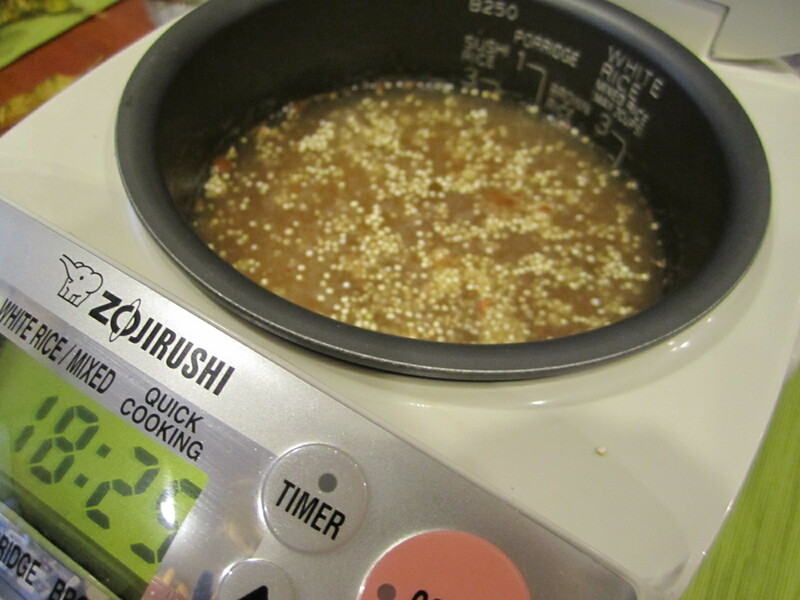 I have found that the quick setting works perfect for quinoa! 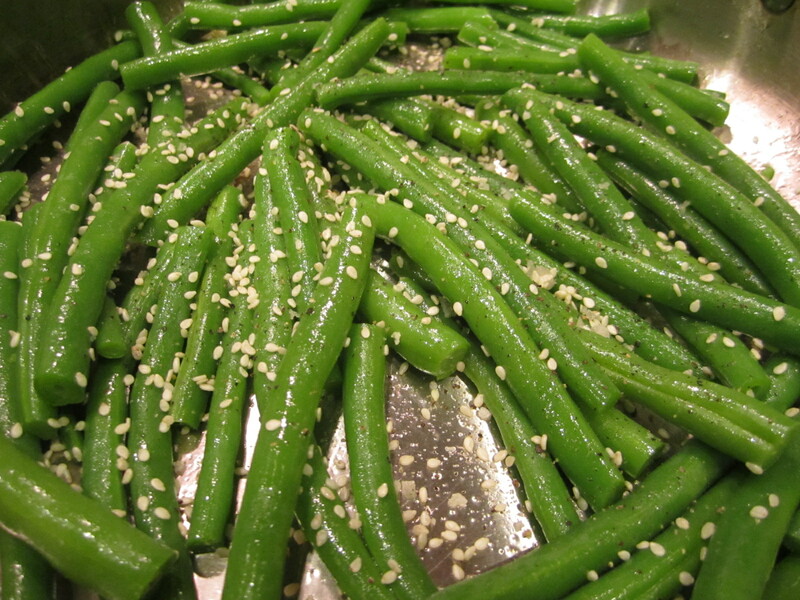 Next up, simple sesame green beans. Cut off the ends of each side. Then, throw them in a colander to wash thouroughly. While you are cutting and washing, boil water in a shallow pan. Once boiling, dump in the beans and blanch for 1 minute just to take the bite off. 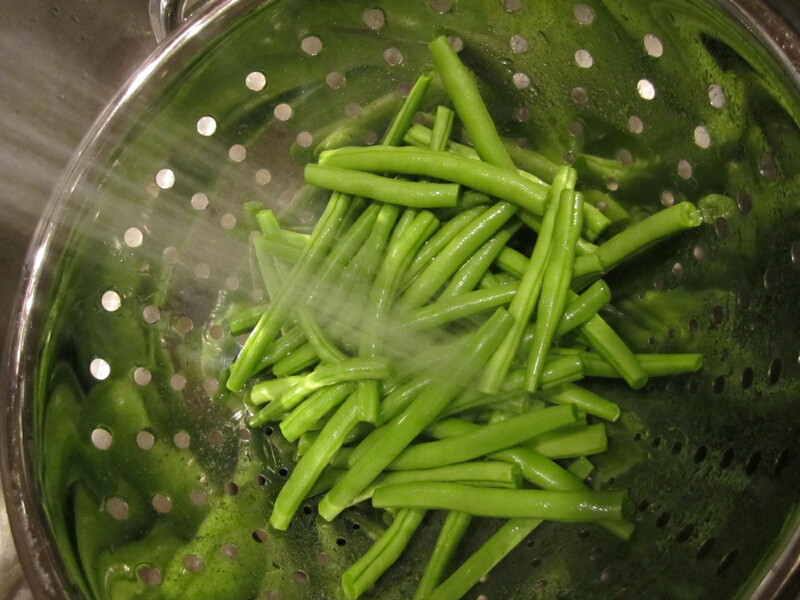 Place back in the colander and rinse with cold water to stop the cooking. Careful dry the pan and add a few tablespoons of olive oil over medium heat. 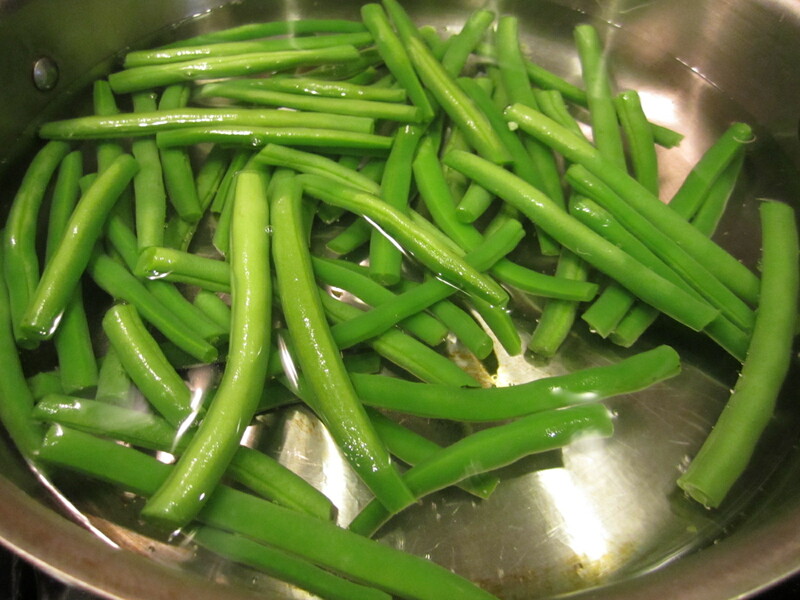 Add the dry green beans and saute for 5-7 minutes until they look a little browned. 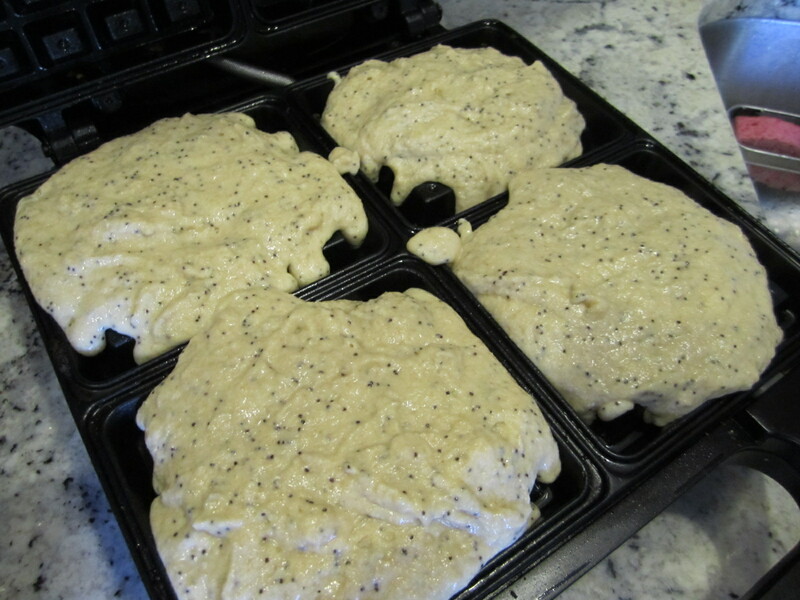 Add a little salt, pepper and a good pinch of sesame seeds. Cook for 1-2 more minutes to toast the seeds. Then, serve warm! 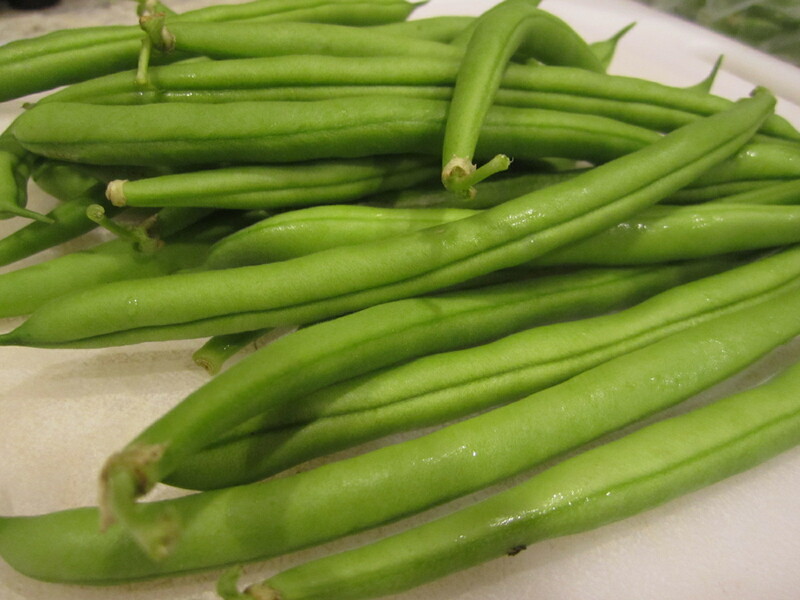 This is our favorite way to eat green beans. They beans stay crisp, but are warm and delicious! 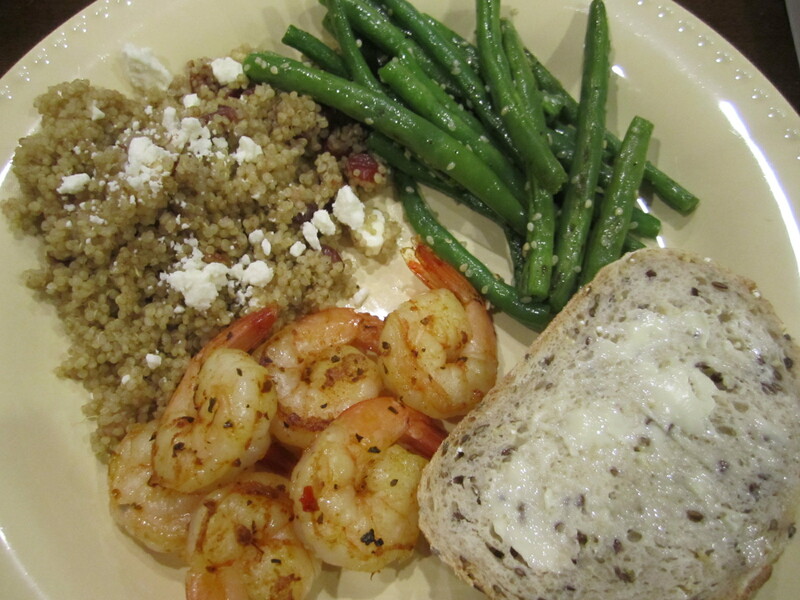 We added the shrimp to another skillet at the same time as the green beans. Saute the shrimp over medium heat for 6-8 minutes until they turn white. Add seasoning of choice (we used a fish seasoning from William Sonoma). 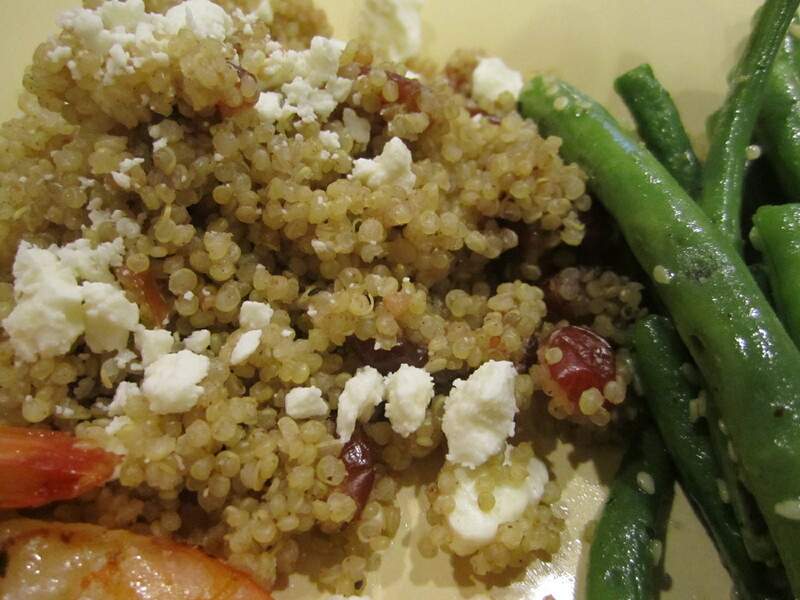 I served the quinoa with a little feta on top. This was a delicious meal! Very quick (preptime and cooking took about 30 minutes) for a weeknight meal. 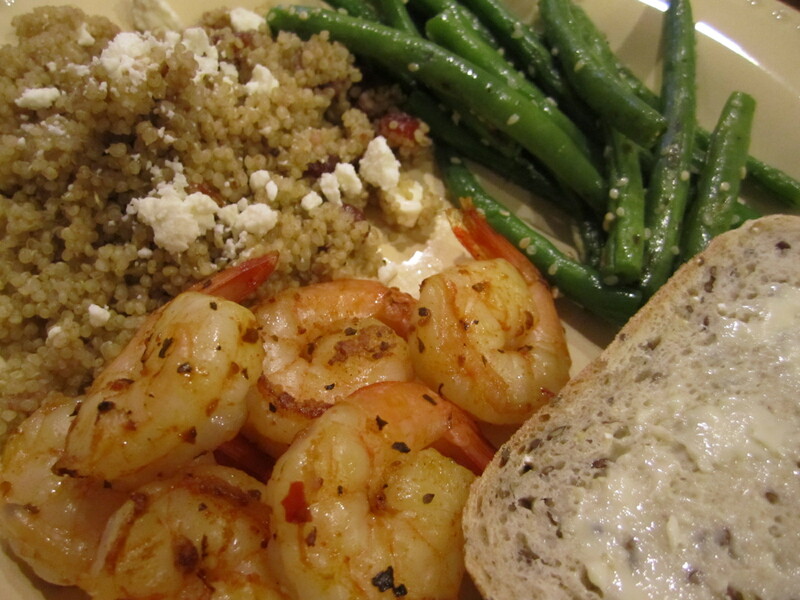 Plenty of greens, protein and omega-3’s from the shrimp! Served with a slice of Flax Quinoa Bread and butter. 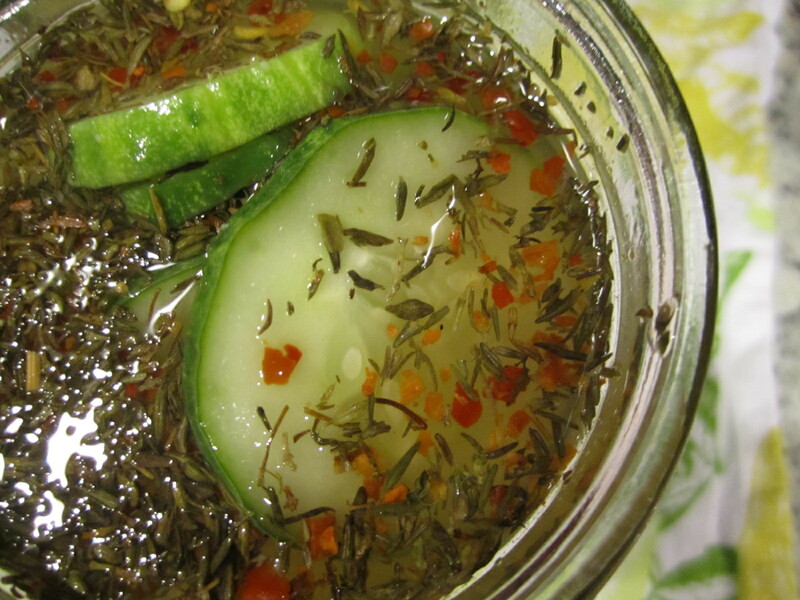 Do you know how easy it is to make pickles?! Especially the ones that you can eat right away and don’t have to let sit for days/weeks to absorb the flavors. We have been receiving cucumber after cucumber in our CSA for the past few weeks, so I decided to chop them all up and make some pickles. And, I made a lot! After reading Ashley’s post a few weeks ago on pickles, I was more than ready to give them a try. She came up with such great sounding recipes, that I decided to just stick with her’s instead of coming up with my own. I did make a few changes, though, which I made sure to list below. You can make these in any glass jars that you have saved. I normally save decent sized glass jars from applesauce, pickles, etc so I had a bunch on hand. Once again, I changed the type of vinegar to what I had on hand and used dried basil instead of fresh. 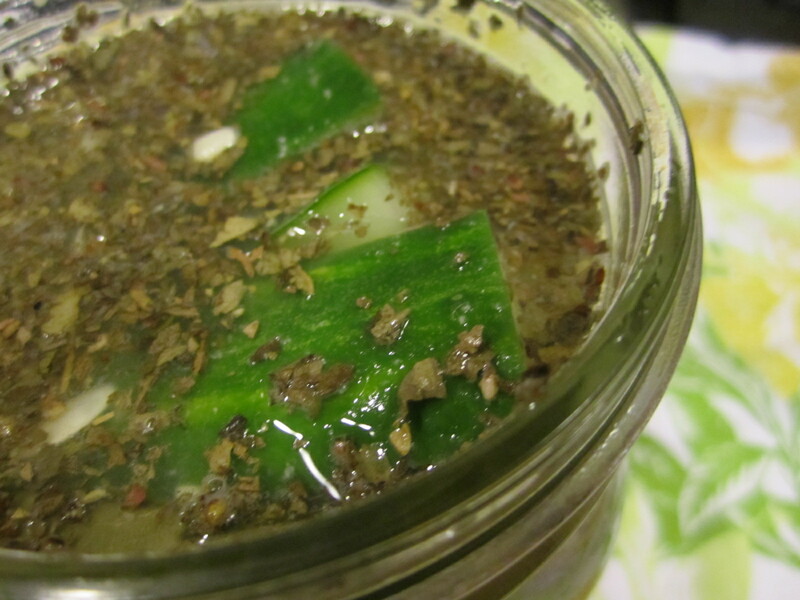 I wanted to make these pickles with exactly what I had on hand, and I made do pretty well. 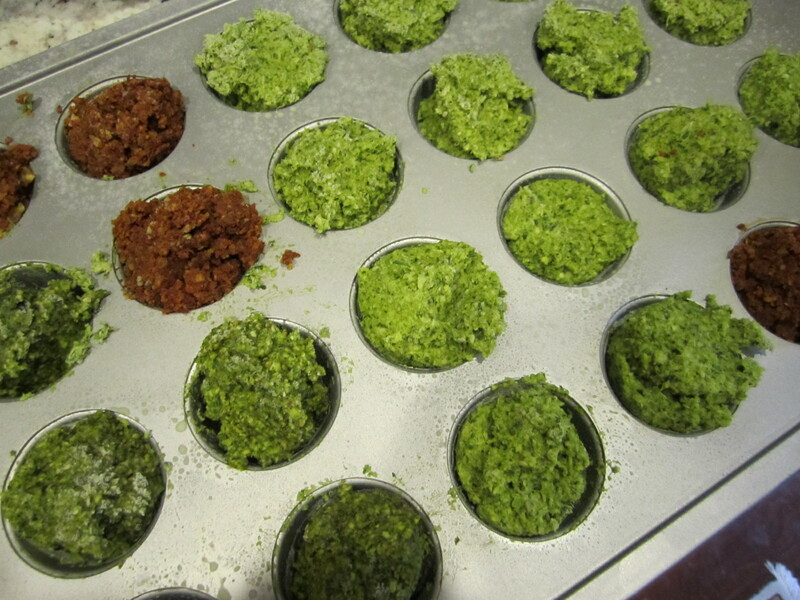 I kept this batch exactly the same as Ashley’s recipe, but used dried thyme instead of dill. This definitely changes the flavor, so next time I will try out the dill, for sure. All of these pickles should be stored in the refrigerator and eaten within a few weeks. Give them a good 4-6 hours to soak before digging in, or leave them overnight for the flavors to absorb. 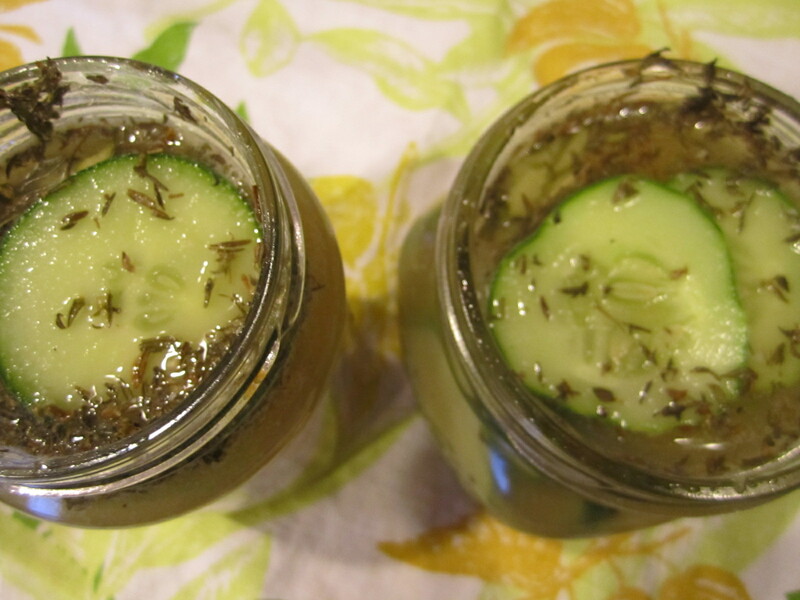 Thank you, Ashley, for coming up with such great pickle recipes! 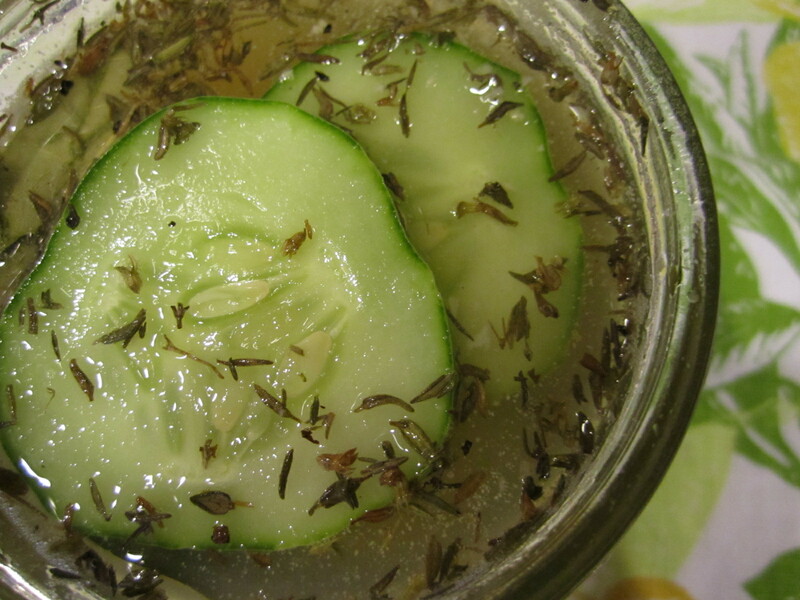 I hope more people can enjoy them with their abundance of pickling cucumbers! Try out her other pickle recipes as well. Do you ever have wierd cravings for food? Honestly, I rarely ever do. I usually eat fairly similar, with a craving for sweets after a meal, but I never really have a strong craving for a type of food. 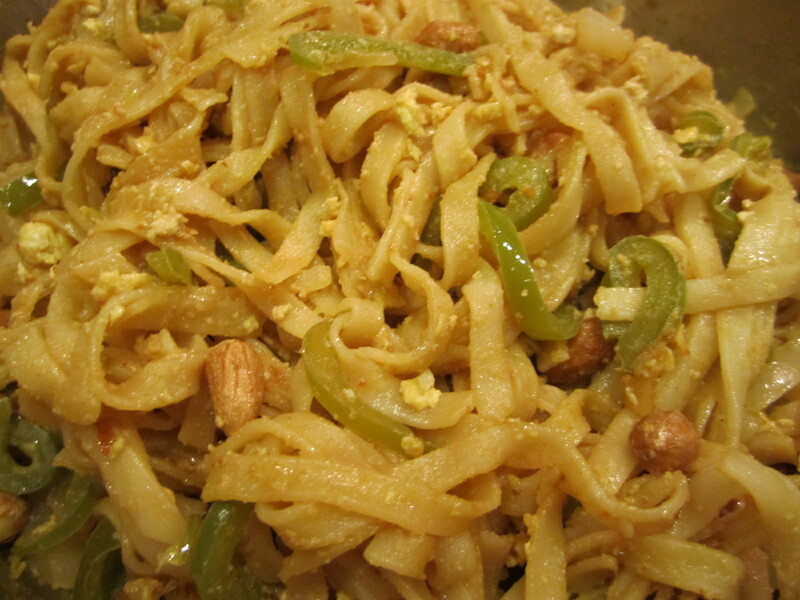 But, last week, I picked up some rice noodles at Trader Joe’s and ever since then, I have been dying to make Pad Thai! So, I did just that. 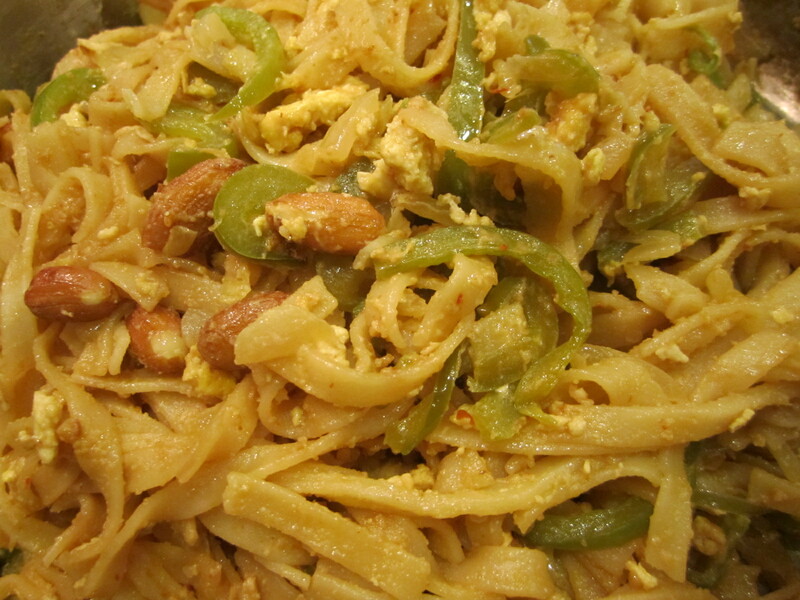 Pad Thai is actually fairly simple to make. The ingredients are simple and you can really add any veggies that you want to. I kept this dish simple, but feel free to add carrots, peas, or other veggies that sound good to you. 1. Cook your rice noodles accoring to the package instructions. 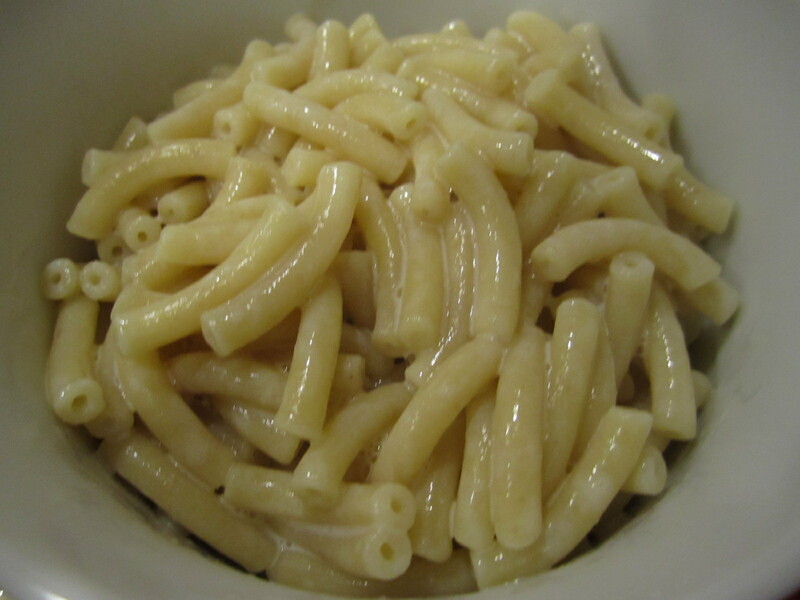 I boiled a pot of water and added the noodles for 6 minutes, until tender. 2. 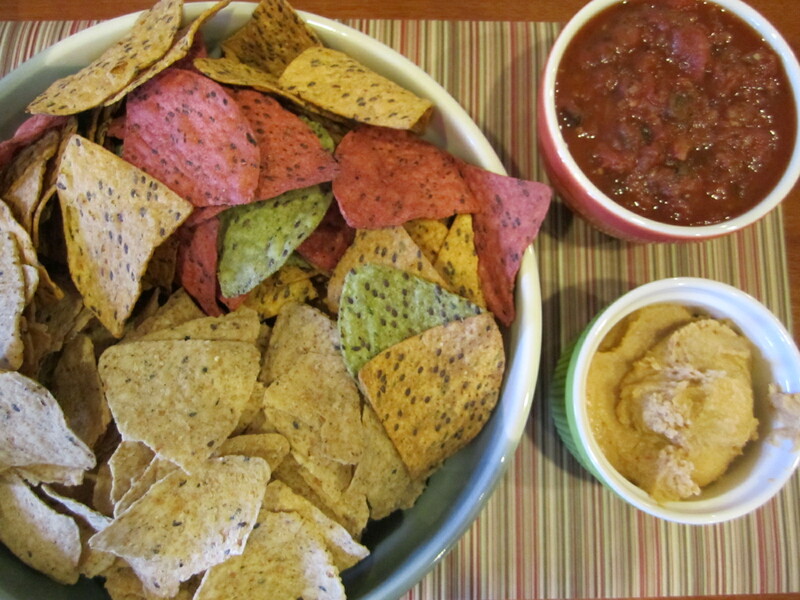 Mix up your sauce – soy sauce, chile powder, peanut butter, sugar and hot water. Set aside. 3. 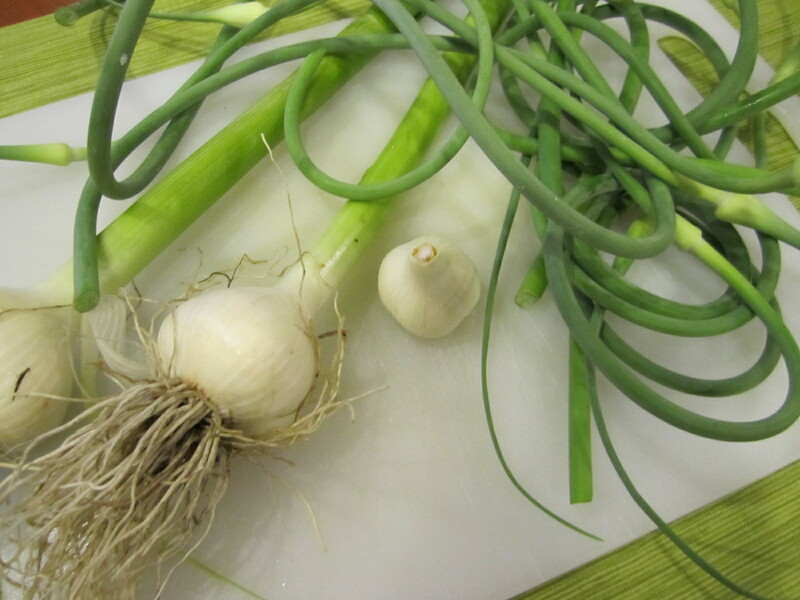 Chop your onion and garlic and cook over medium heat with 1 tbsp oil until tender, about 3-4 minutes. 4. Add in your pepper (and other veggies if you wish) and cook until tender, about 2 minutes. 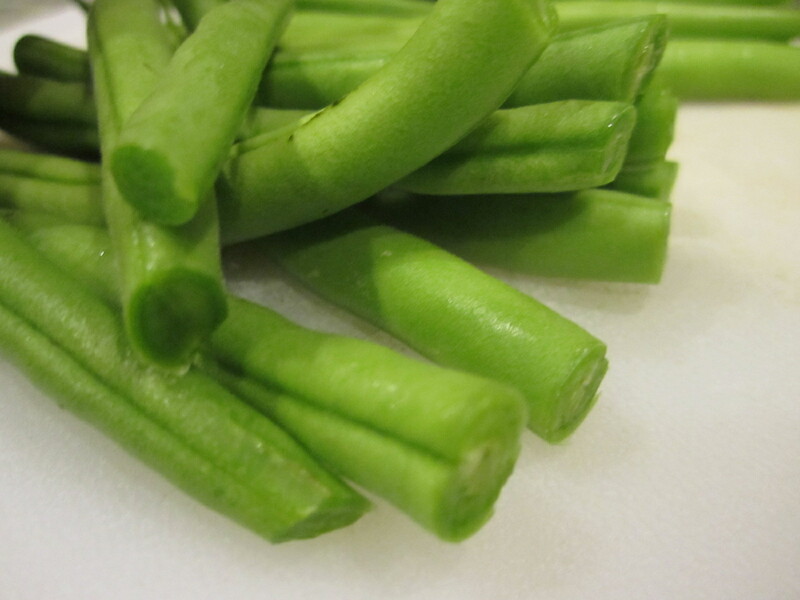 All of the veggies should be cut into small strips so that they cook evenly. You don’t want them mushy, but you want them a little less than crunchy. 5. Push your veggies to the side of the pan, add 1 tbsp of oil and crack the 2 eggs directly into the pan. Using your spatula, scramble the eggs (they will cook quickly). 6. Once the eggs are cooked, push them to the side with the veggies, add 1 tbsp of oil, the cooked rice noodles and 1/3 of the sauce. Mix everything together, including the veggies and cook until the noodles are sticky. Continue adding the remaining sauce and mix it all together well. Keep mixing, as the noodles may stick to the pan. 7. Top with crushed peanuts and serve warm! I had a really hard time taking a good picture of this pad thai, but don’t let that fool you. It tasted really good! I was plesantly surprised and so was my husband! Since I was already making pad thai, I thought I would make up some fried rice as well. I never really understood fried rice…was the rice really fried? Well, I’m still not sure, but this is a bit of a healthier version. If you already have pre-cooked rice, this recipe is very easy. If not, then cook some rice and have it in your fridge ready to make this recipe. The rice tastes better in the recipe if it is a few days old. 1. Cook your rice according to package instructions, or use leftover rice. Have this prepared before starting to cook the rest of the recipe. 2. 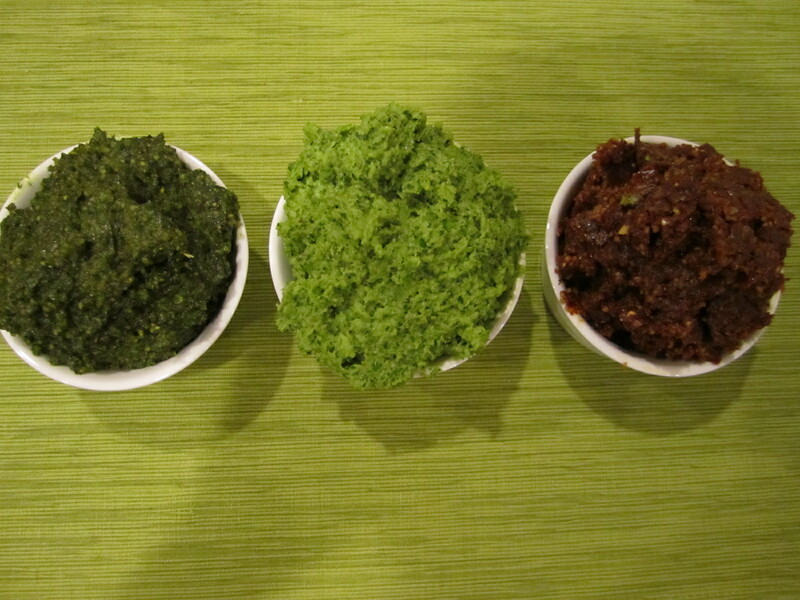 Mix together your soy sauce and curry powder. Set aside. 3. Heat 1 tbsp oil in a large wok over medium-high heat. Add the onion, garlic and chile pepper and stir-fry until tender, about 2-3 minutes. If the wok becomes dry, add 1 tbsp veggie broth to keep is sizzling. 4. Crack the egg into the wok and scramble it quickly. 5. Add the corn and cashews and mix for 1 minute. If the mix gets dry, add more veggie broth. 6. 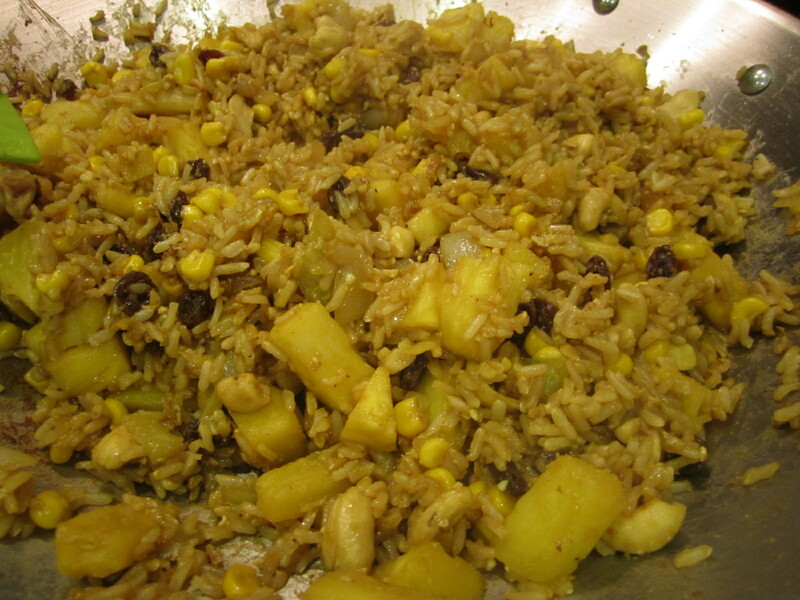 After everything is mixed and cooked, add the rice, pineapple and raisins. 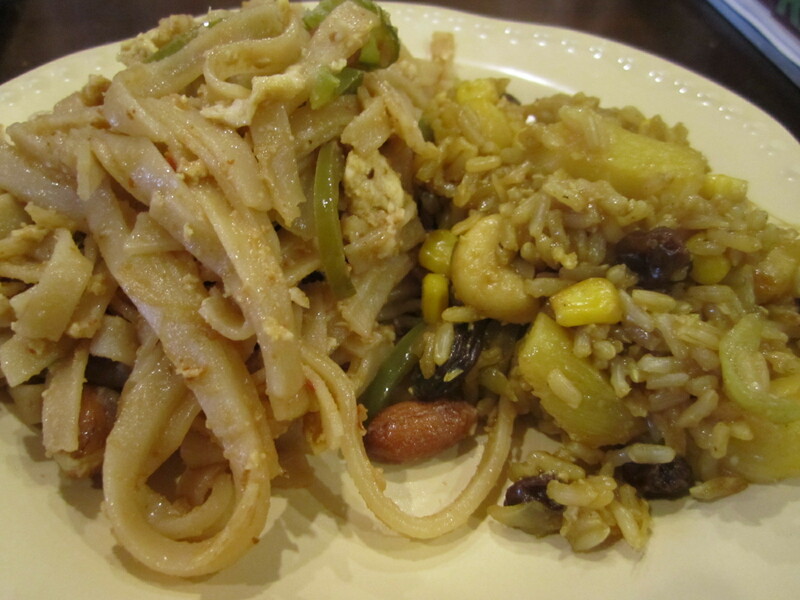 Mix everything together with the previously made sauce and stir fry until warmed and the rice becomes crisp. At this point, the pan should be dry, so do not add more veggie broth. You do not want to end up with soggy rice! Yum! This was awesome. 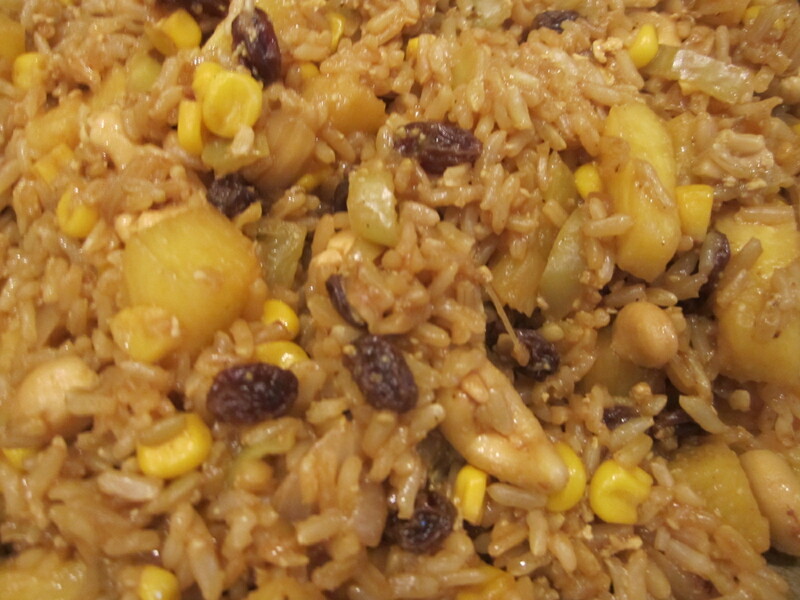 I loved the rice with the pineapple and raisins. They definitely made the dish. The salty soy sauce and pineapple were perfect compliments. 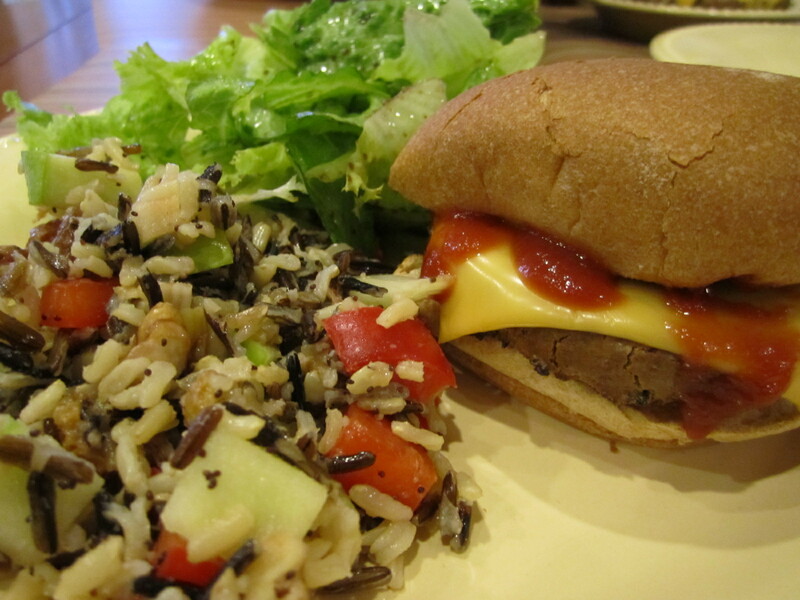 This was an easy, cook-at-home, take-out meal. And, to me, it tasted much better than any take-out. So, don’t fight the craving! 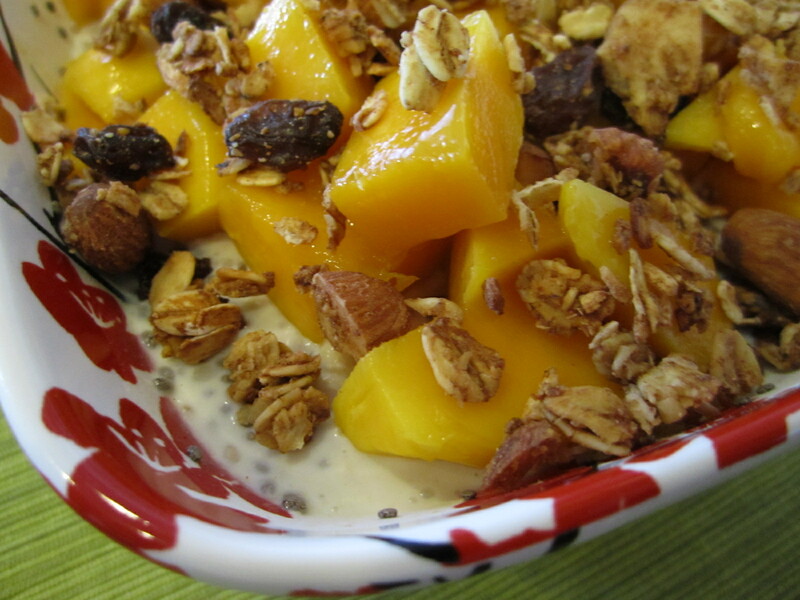 Just make a healthier version at home! 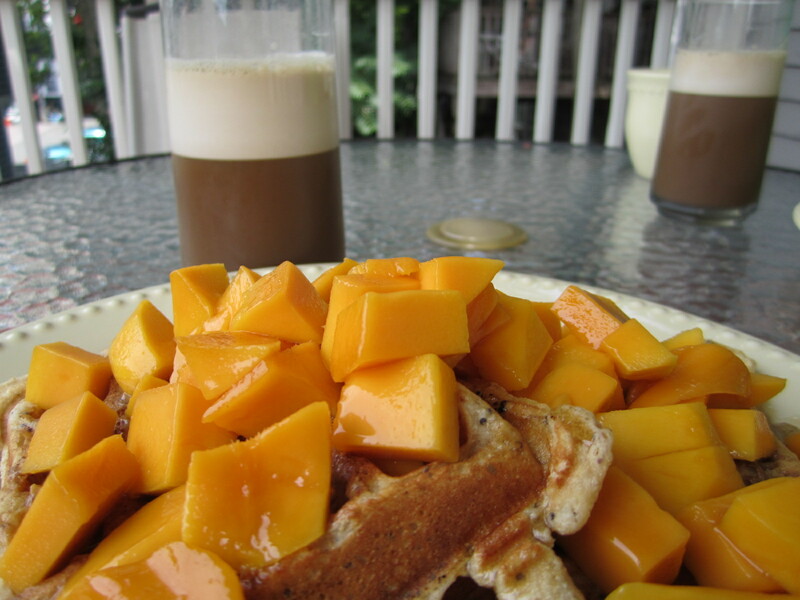 Saturday morning we wanted to be lazy, so we made up some waffles and lounged on our porch. So relaxing! Mix the dry ingredients together in a bowl. Then, mix the wet ingredients in a bowl and pour into the dry ingredients. Mix well, but do not over mix. 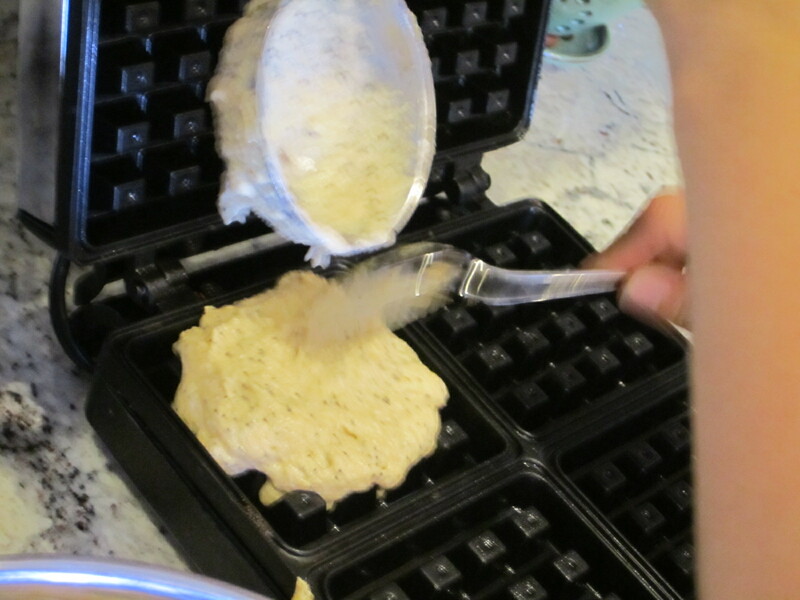 Preheat your waffle iron, then scoop the batter onto the iron by the ladelful. 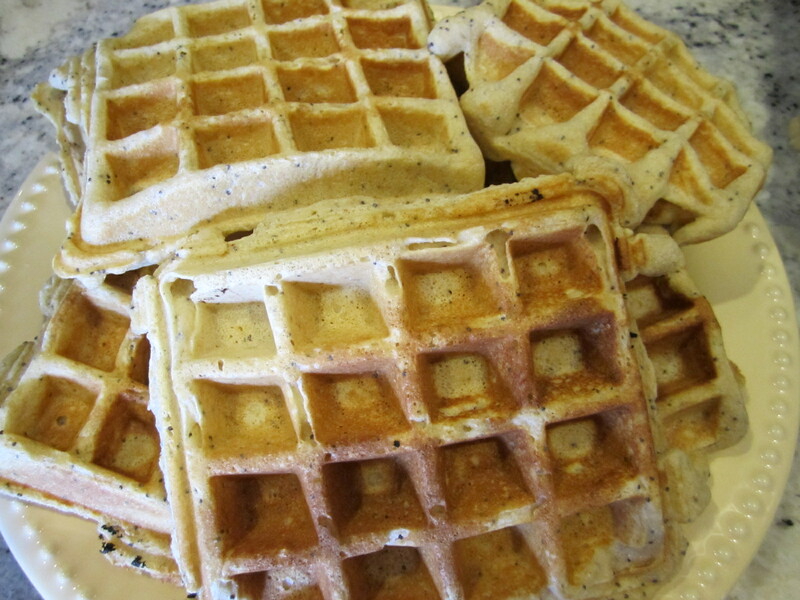 Cook until the light goes off (or at least that is how long on our waffle iron!) and slightly browned. 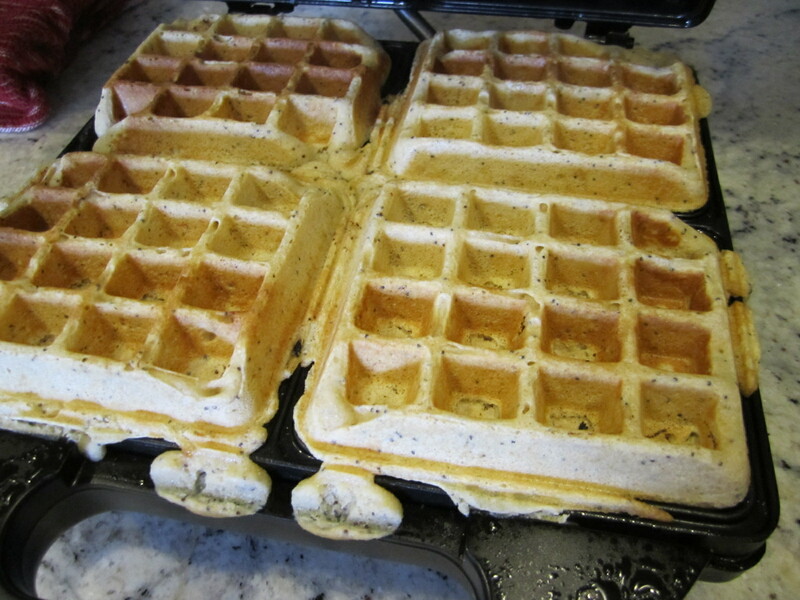 This recipe made 6 full waffles. 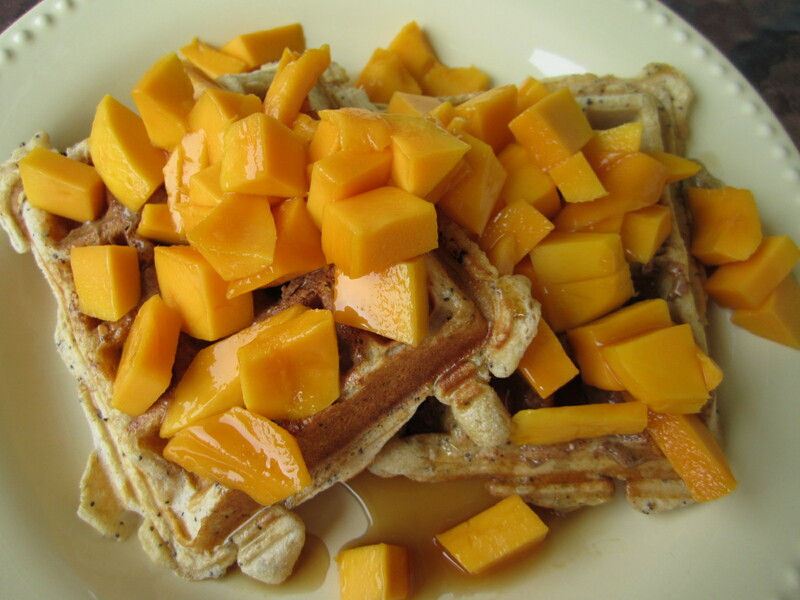 I served myself 2 waffles with a thin spread of almond butter, a champagne mango chopped up and a drizzle of maple syrup. Two of my most favorite things are avocado and cucumber, especially in the summer. Cucumbers are so refreshing. They contain a lot of water which will help to keep you hydrated and they taste good so many different ways. This week, I was searching some blogs for recipes and came across and Avocado Cucumber Smish Smash from Kristen, so obviously I had to try it out! 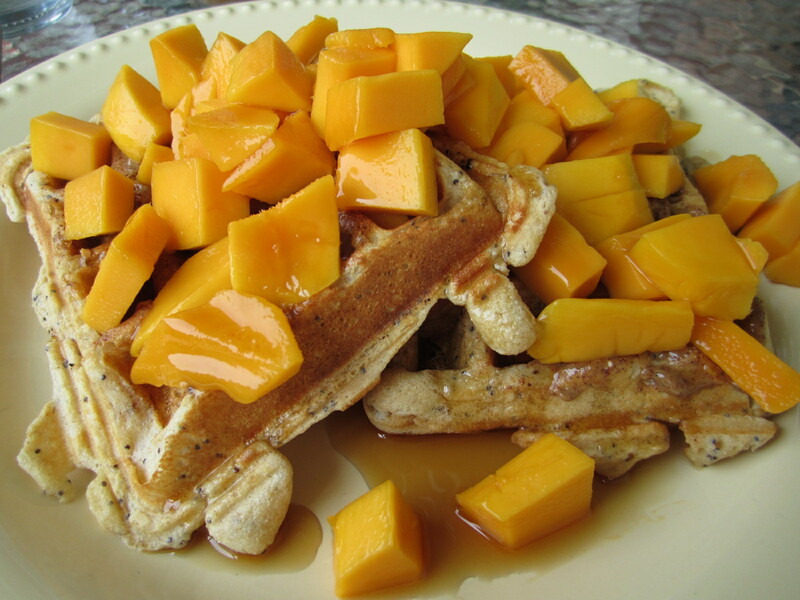 Check out her website for the full recipe, but I will tell you that it only contains 4 ingredients! It is so simple, refreshing and delicious! You definitely want to give it a try. 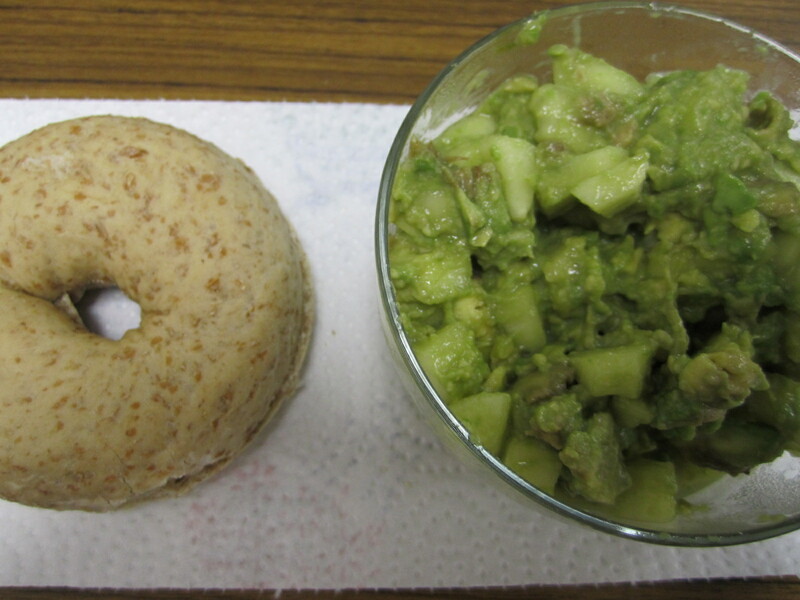 I used a whole cucumber and 1 avocado for mine and made a meal out of it on top of a sprouted wheat bagel. Thursday night I prepped some overnight oats to enjoy Friday morning and placed them into the fridge to ‘sleep’. I mixed everything up and let it sit in the fridge overnight. 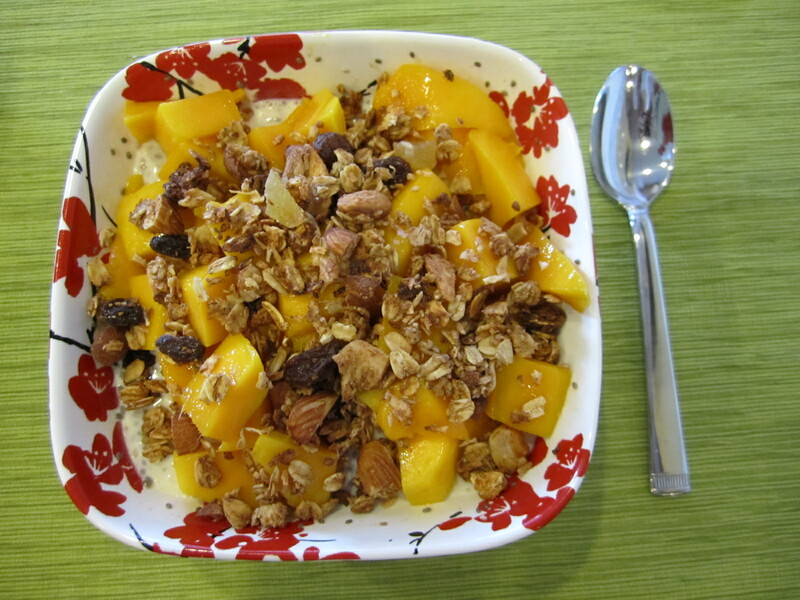 When I was ready for breakfast, I pulled out a delicious bowl of cold oats. 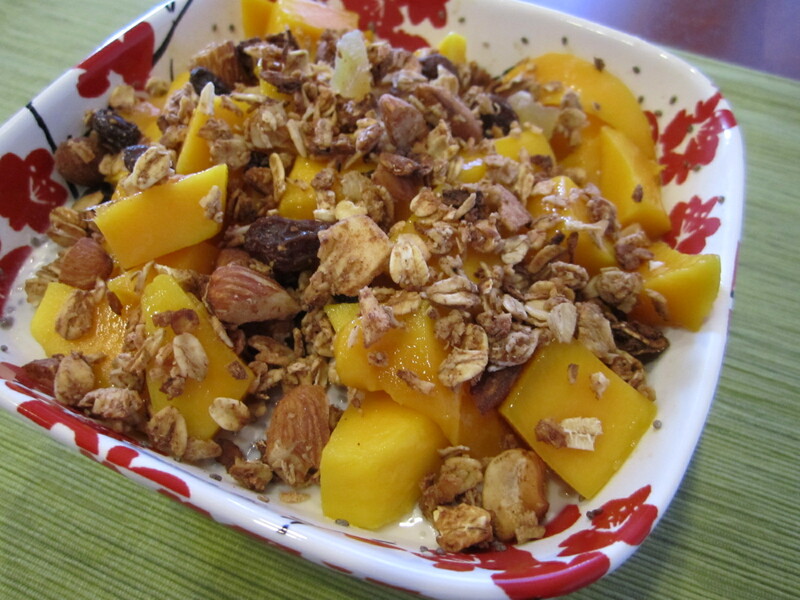 Topped with a super ripe champagne mango and homemade chai granola. 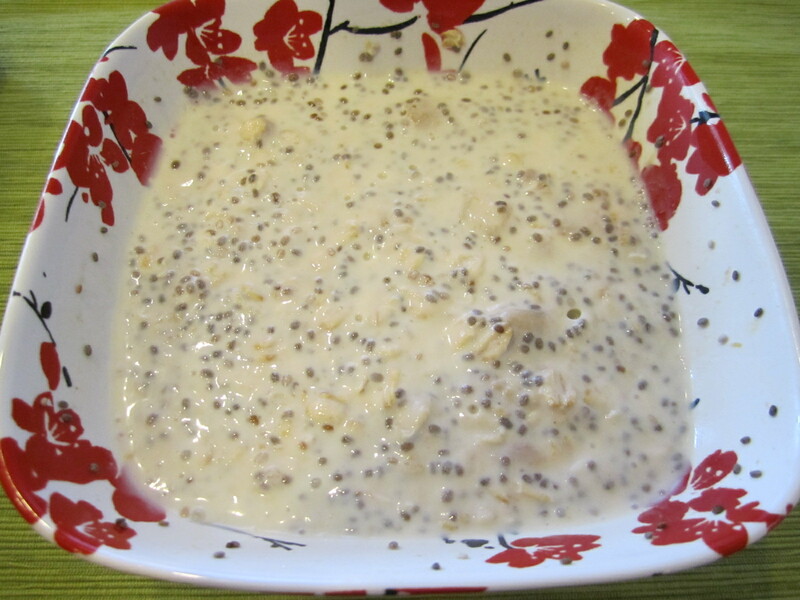 Chia seeds are a miracle worker…they make the overnight oats! It was great and really filling. Dinnertime rolled around and I was ready for some BBQ-ing! It is perfect BBQ weather today, so we were psyched. 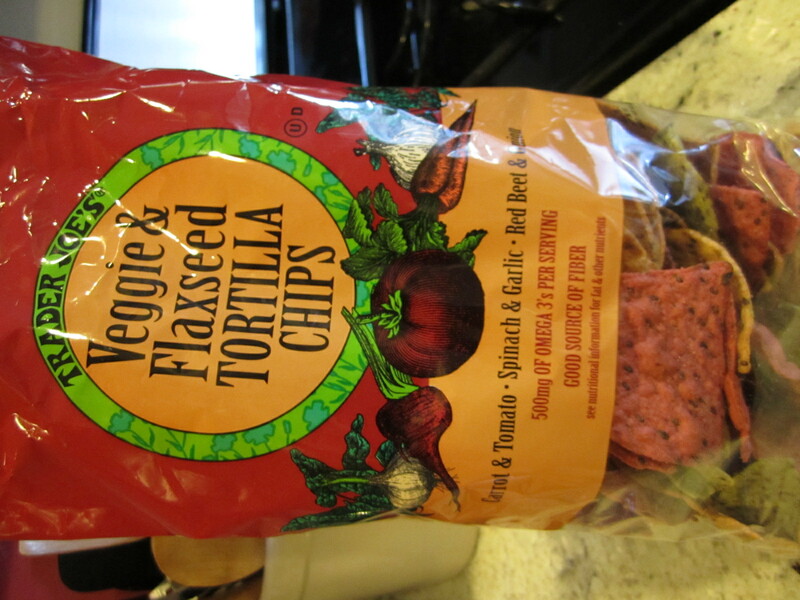 Has anyone tried these chips from TJ’s? They are great! 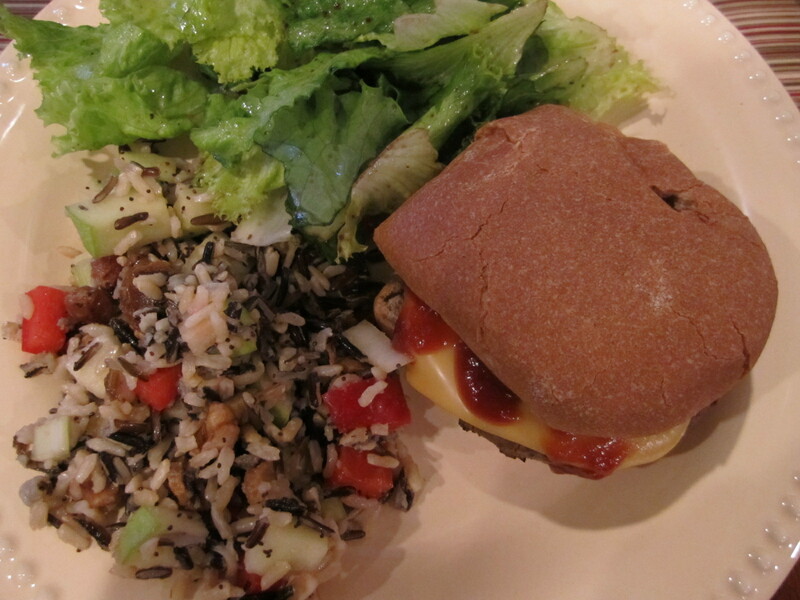 Wild Rice Waldorf Salad, Green Salad with CSA lettuce and honey balsamic dressing and a veggie burger for me! Lots of good stuff. I love Friday night’s at home! 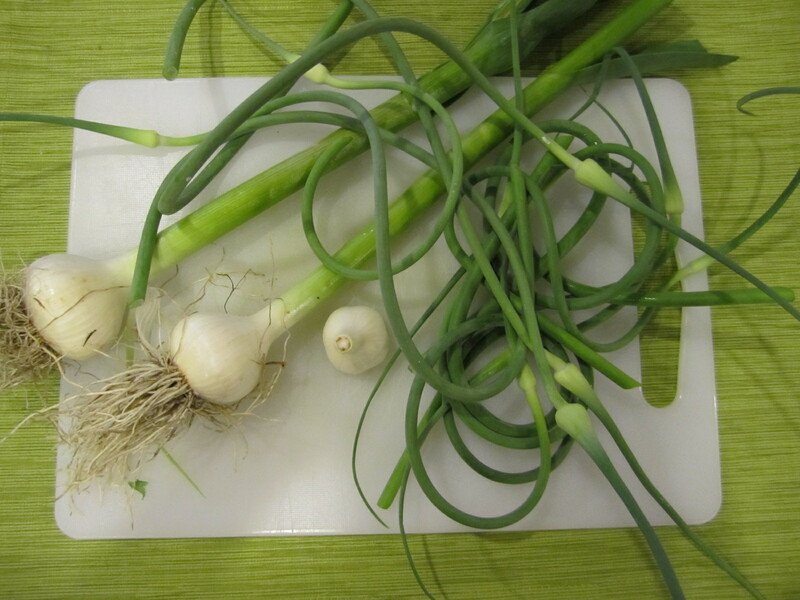 What is a girl to do with all of this garlic? I mean, I do love garlic, but you can only use so much! I comtemplated making a few different things, but decided to make three big batches of pesto since it can be easily frozen to use later on. I started with my own version. 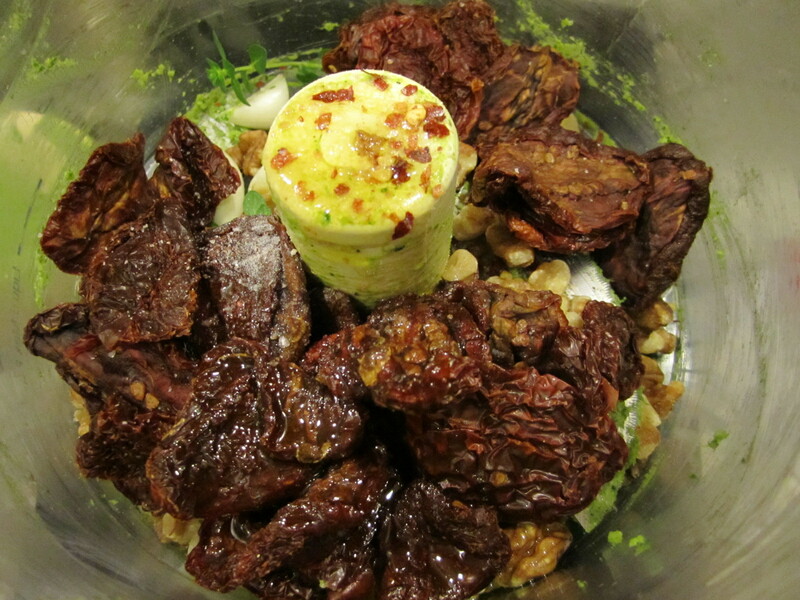 Throw everything into a food processor and blend away. 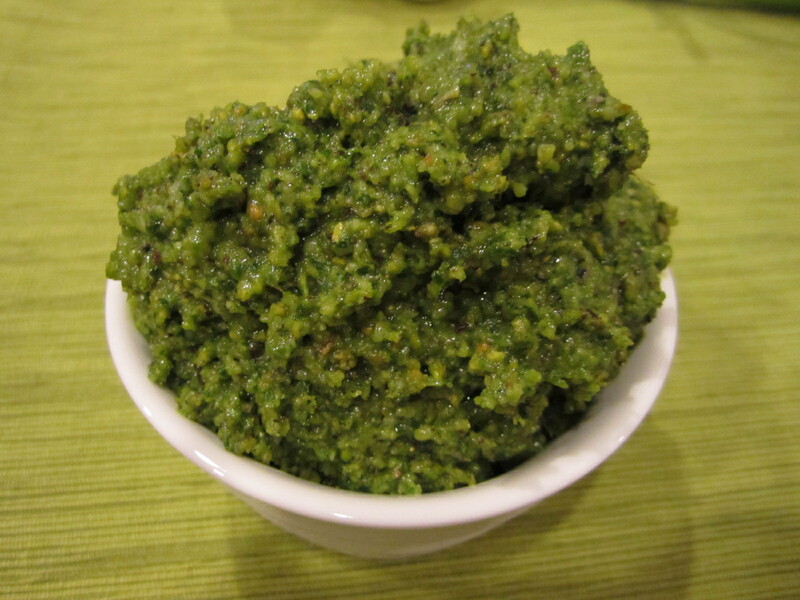 This pesto is awesome! 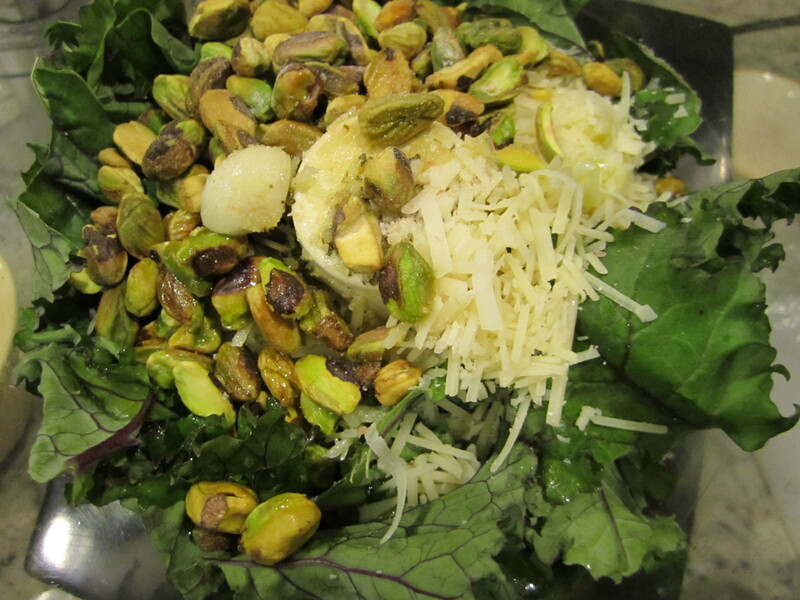 Surprisingly, the pistachios were a wonderful addition to this recipe! I was a little ify about making this one, but really wanted to try it out. I’m glad I did! It is delicious…I even ended up doubling the recipe. 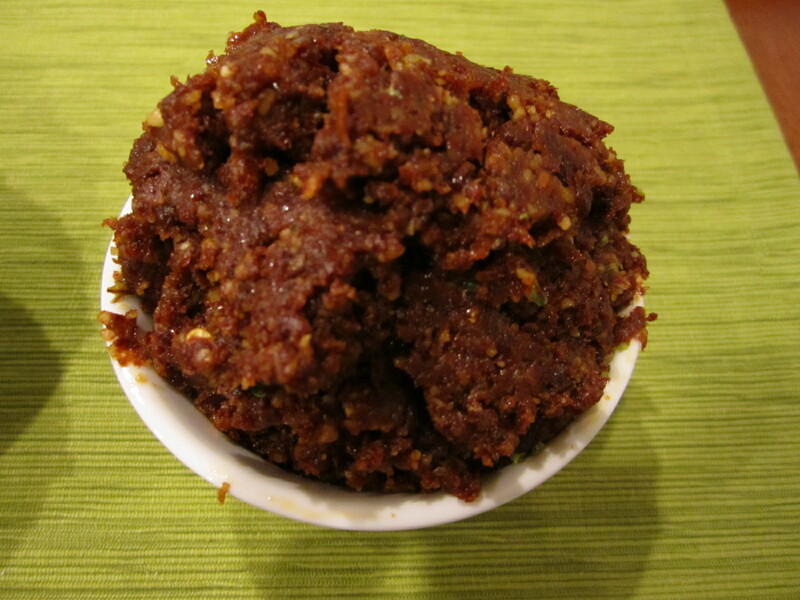 The garlic scrapes give it a hint of garlic, but it is not overpowering at all – yummy! 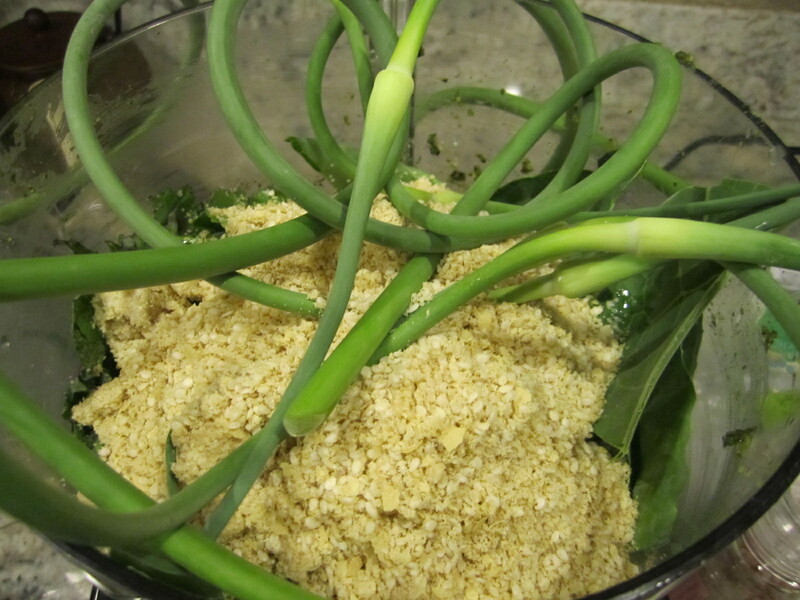 First, make your Vegan Parmesan Cheese! Throw 1/2 cup toasted sesame seeds, 2 tbsp nutritional yeast and 1/4 tsp of salt into a food processor and blend until crumbly! 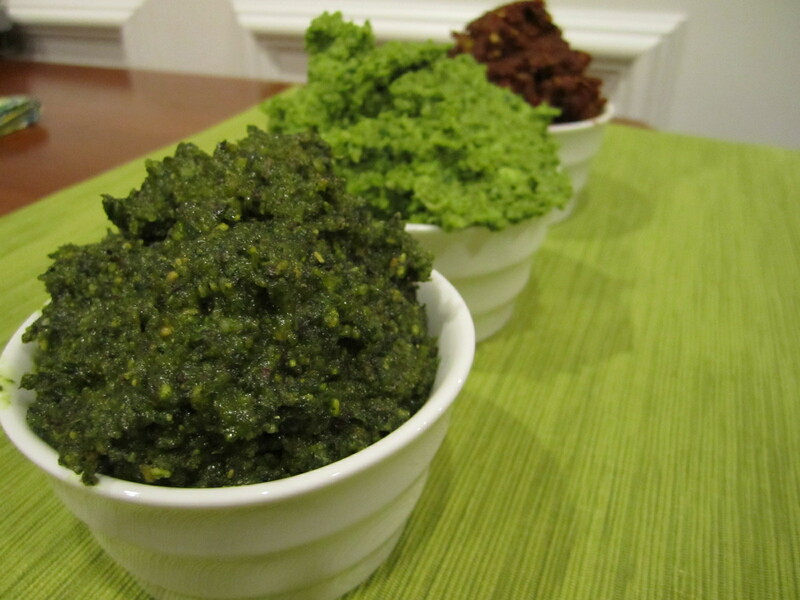 Then, mix up your pesto! 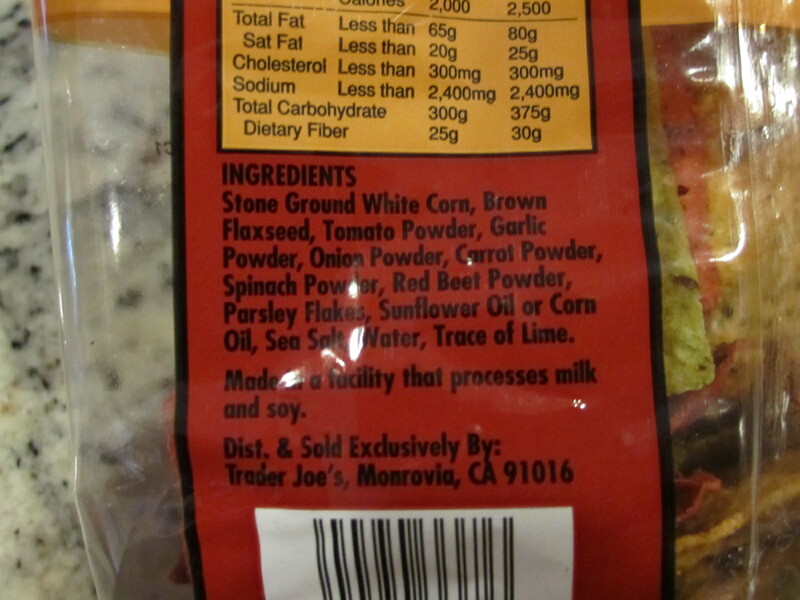 Throw it all into your food processor and blend. The vegan parm cheese is surprisingly cheesey! Lastly, our favorite red pesto from 101cookbooks.com. 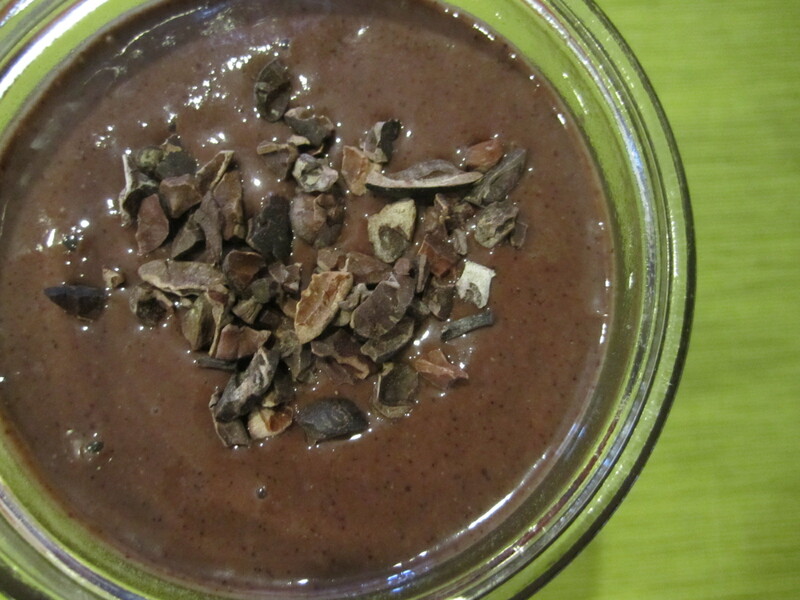 Put the following ingredients in a blender and blend until you love the consistency. 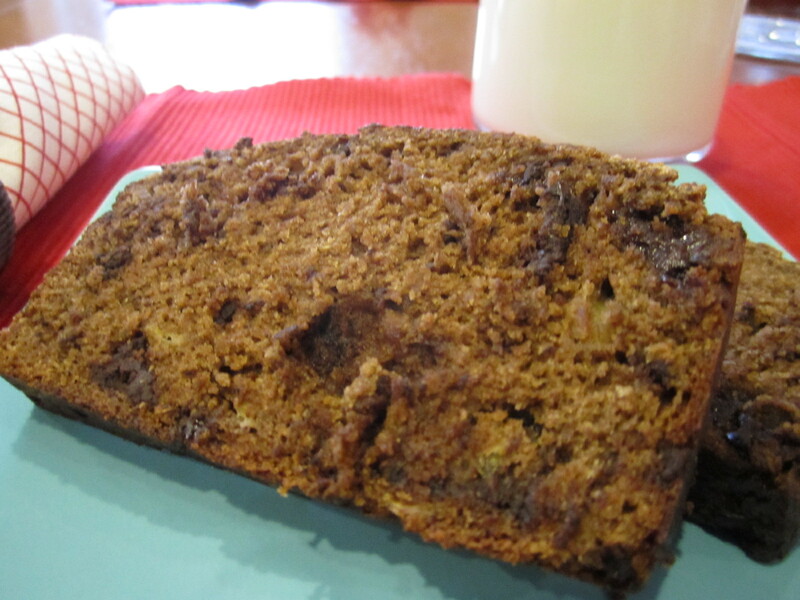 I like to leave this one a bit more ‘crumbly’ because it tastes great! I ended up doubling all of these recipes and put 1/2 away in the freezer. 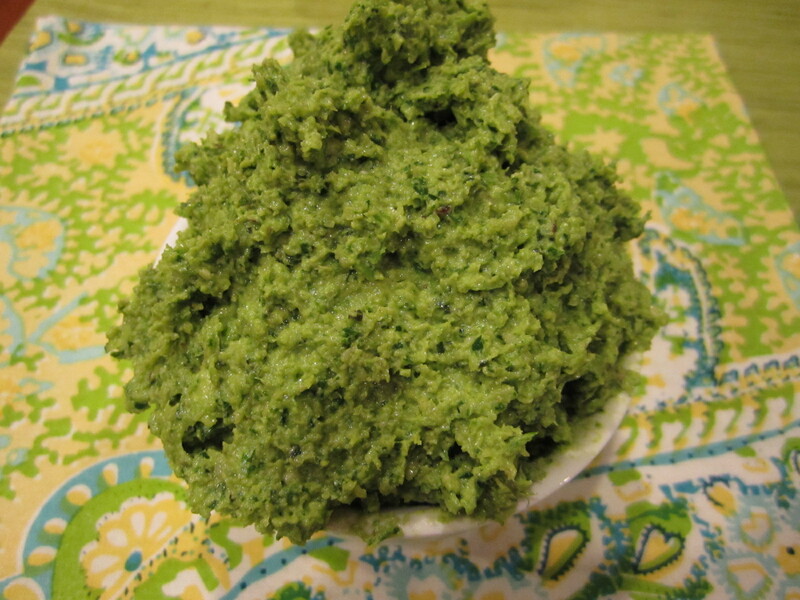 How do I freeze pesto? 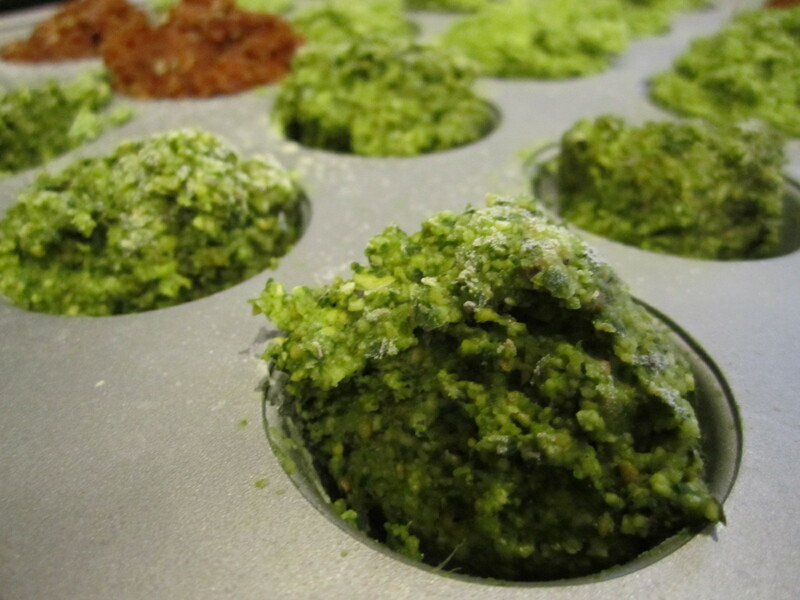 Spray a muffin tin with olive oil and put fresh pesto into a mini muffin pan (or ice cube trays) and freeze. After they are frozen, they pop right out of the tin. Put in a ziplock bag or tupperware and store in the freezer. This way, you can just take out and defrost what you want, instead of having to defrost the entire jar of pesto at once. I like to take a few cubes out and defrost them over low heat with a little extra olive oil to make sure it mixes up well. 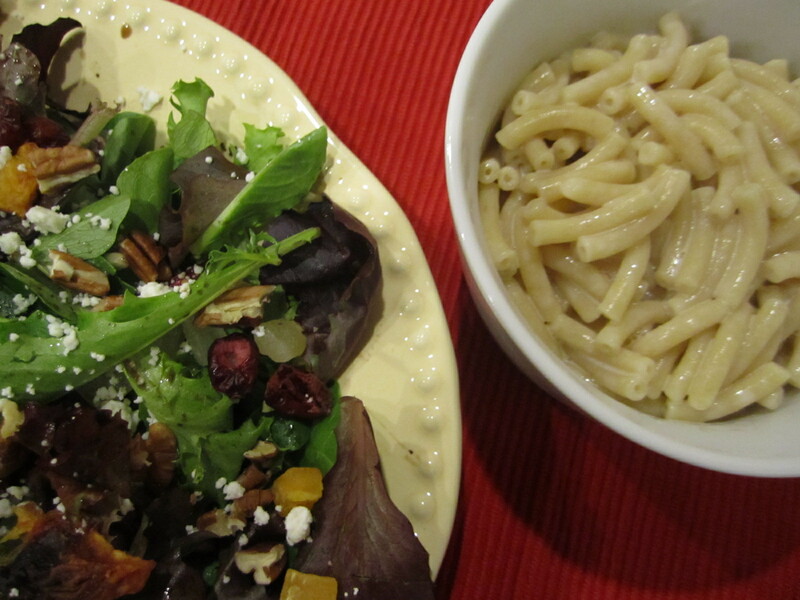 Serve over pasta, rice, vegetables, in salads or anyway your heart desires!